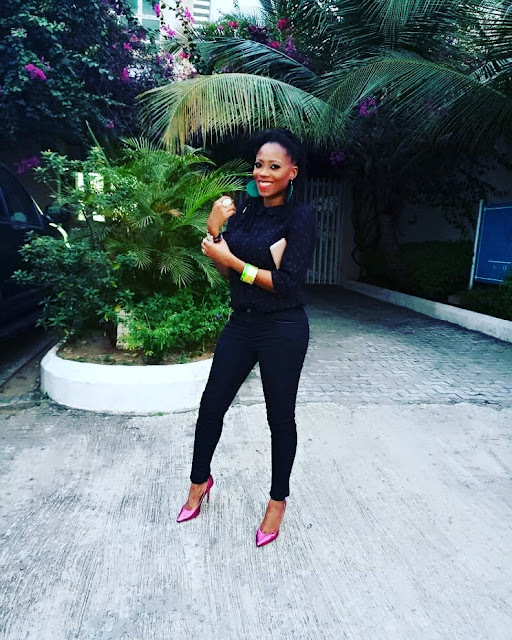 Tosyn Bucknor's Blog: 3 Ways to go from Casual To Glam Casual! Just here thinking about how while getting all dolled up is fun, my favourite go-to when it comes to style will still be the casual look. There are times you need to upgrade your casual styles though, and I have got just the tricks for you!
. Pair your Casual with One Glam Item. Be it a shirt over jeans or jacket over your tee, take casual to glam with one item. Your choice of footwear is important. A pair of heels instantly transform any look so if you can, invest in heels in different colours. If 'issa no' when it comes to heels, don't despair. There are some really glam flat options to reach for as well. In the same vein, ditch your usual bags for something more glamourous and you are glam to go!
. Don't forget your Face. To complete the casual to Glam Casual transformation, do take some time with your hair and face. Remember to keep your make up simple but dramatic. A good smokey eye or red lipstick (never both together) will glam you up. For your hair, try an up-do with basic hoop earrings and voila! Say hello to glam you.